Overjoyed in capturing 16 fabulous shots of this strikingly beautiful butterfly Graphium agamemnon (Tailed Jay) recently, I then proceeded to create a collage of this beauty! Something I enjoy doing when I possess the right photos. Most of the images were close-ups, but there were 3 that stood out well for my purpose which was to display the different positions of its wings in a single photo. If you’d like to make a photomontage like this, read on! Basically it was extracting the main object which was the green-spotted butterfly with the leaf, from two cropped images and merging them into a chosen background picture to create a lovely collage. There are many ways of extracting, but here I chose to do it with the Eraser Tool, which is simple and uncomplicated. Step 1. Envisage a theme for your collage, then select your photos and make copies of them beforehand as it is unwise to work on originals. Then, in Photoshop open those copies – Choose File > Open and browse to select the images that you want. In this tutorial, the following 3 pictures were used. All have the same measurement of 1200 x 1600 pixels with a resolution of 96 dpi and straight out of camera. Step 2. Click anywhere on Picture #1 to activate it. This will be the Background image for the collage. Then in the Layers Palette, duplicate the Background layer – right-click on the layer and select Duplicate Layer or press shortcut keys Ctrl+J and you will notice a Background copy is created in the Layers Palette which Photoshop has named it Layer 1. You can double-click on the name to rename it if you want, I chose to rename it ‘Collage’. Then, click on the Eye icon to the left of the Background layer to remove visibility. Step 3. 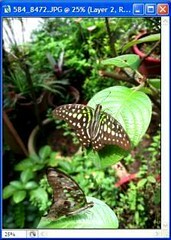 Next, activate Picture #2 to crop out the butterfly and leaf. To do this, select the Rectangular Marquee Tool from the top left of the toolbar (if it is unseen, click and hold down the icon until a fly-out appears and choose your tool), and drag to draw a selection border over the area of your image that you want to keep. This is illustrated in the right image. Step 4. Now, you’ll need to drag the selection border from Picture #2 to the Collage Background image (Picture #1). First, select the Move Tool from the toolbar (or tap V to activate this tool), then click inside the selection border and drag to the Collage image. 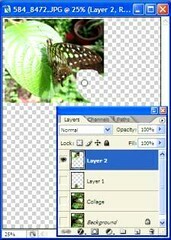 Observe that as the cropped image is being added to the Collage, a new layer named Layer 1 is produced in the Layers Palette. You can rename the layer or leave as is, I chose the later. Meanwhile close the window of the Picture #2 as you’ve no more use of it. 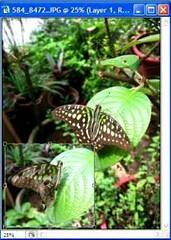 Reactivate the Collage image window to continue the process. 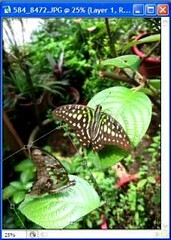 You would have noticed that the newly dragged in butterfly and leaf are not proportionate to those in the Collage. So, that need to be rectified. First, target Layer 1 by selecting it in the Layers Palette. (Note – Always make sure the correct layer is targeted in the Layers Palette before making any changes). Then tap Ctrl+T (or go to to Edit > Free Transform) and a bounding box appears around the edges of the layer with anchor points on all the sides. You can then resize the image. Holding down the Shift key as you drag from a corner handle will maintain the proportions and would not distort the picture. When desired size is achieved, double click inside box (or tap Enter key or click the check sign at top options bar) to accept transformation, otherwise tap Esc (or click the circle with slash) to cancel it and start all over again. Step 5. Now, to remove unwanted areas and leave behind just the butterfly and the leaf. This can be easily achieved with the Eraser Tool. 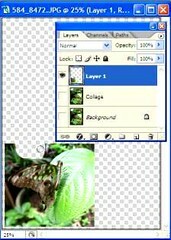 First, remove visibility of the Collage Layer in the Layers Palette by clicking on the Eye icon to the left of it, as illustrated in the right image. That leaves just the Layer 1 visible and makes it easier to work. You would also need to magnify the image to a suitable working size by gliding the Zoom Slider at the Navigator Palette at top right corner (select Window > Navigator if not displayed yet). You can use this Palette to quickly change the view of your image, using the thumbnail display. 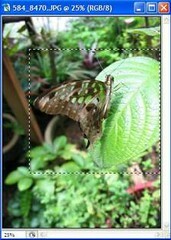 Drag the colored box within the image thumbnail to view a specific area or click inside to designate the viewable area. Alternatively, you can use the Move Tool (tap V to activate), click and move your image around to see where needs smoothening or removal. Select the Eraser Tool from the toolbar and set to a large brush (about 50px) with 100% hardness (reduce the % if may prefer a softer effect) at the top options bar. Then drag it over large unwanted areas to erase them, gradually changing to a much finer brush size (right-click to change) as you get nearer to the outlines of the butterfly and leaf. If wrongly erased, just press Ctrl+Z to undo or jump to any recent changes made in the History Palette. 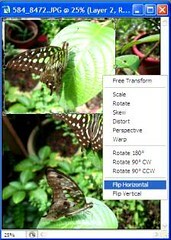 When all unwanted areas are removed, leaving behind only the butterfly and leaf, toggle back the visibility of the Collage Layer by clicking to the left of its thumbnail. Step 6. Next, to rotate the extracted butterfly to a more appealing angle and blend with the overall broader picture. First, select the Layer 1 in the Layers Palette again and then press Ctrl+T to bring out the free transform bounding box around the image. Then position your cursor just outside the box and when it changes to a curved double-headed arrow, click and drag to rotate as desired. Next click inside the box and move the image around to see what looks better where. When you’re satisfied with its positioning, just double-click in the box to accept the transformation. 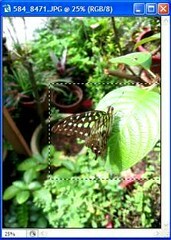 First photo shows the rectangular selection border created on Picture #3 (refer Step 3). Second photo shows the cropped selection already dragged to the Collage (it will appear as Layer 2 in the Layers Palette) and will be resized, basing on Step 4. Here, the image will be flipped horizontally to give a more pleasant outlook and to hide the unsightly straightened edge of the leaf. To do this, right-click inside the free transform bounding box to bring forth the fly-out list (as seen in image), then select Flip Horizontal and double-click in box to accept. Fourth photo shows the final repositioning of the extracted butterfly and leaf (refer Step 6). 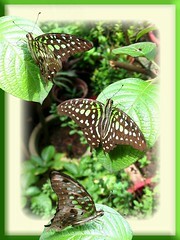 There you are, a fun collage of 3 butterfly pictures blended together. 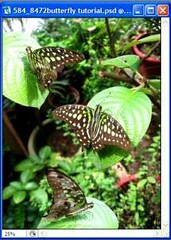 Beautiful, isn’t it…as if seen and captured in a butterfly farm or in their natural habitat! Wouldn’t you like to enhance its attractiveness? Photoshop has such powerful tools and features to do that. I just know some basics but even the basics can produce such gratifying rewards, I think. Here, I would like to continue sharing with you the steps taken and you may want to give it a try yourself. Have a look again at the top most picture of this article and if you’re game, read on! Step 8. By just applying a combination of a few layer styles to the Collage, you can create an arty and fancy border or frame, adding depth and beauty, as well as presenting a lovely 3-D (three-dimensional) effect to the picture. With the Collage Picture window still activated, start off by selecting the Collage Layer that you want to work on in the Layers Palette. Then, bring forth the Layer Style window – you can either double-click to the right of the Collage Layer or click on the Add a layer style icon (letter f within a circle) at the bottom of the Layers Palette and select any option. You can even go to the top menu bar, choose Layer > Layer Style > Blending Options. Step 9. Here is an image of the Layer Style window as it appeared with the Stroke effect selected to start with. On the right side of window, check that Preview is selected to allow you to view the styling effects on your image as you make your choices. On the left side are the various Layer Style effects available. 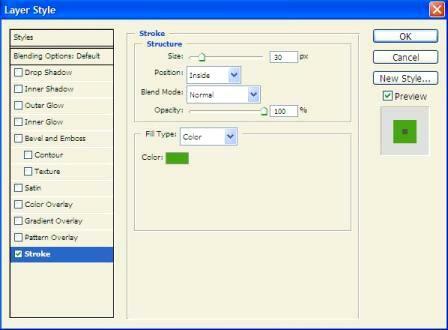 Click on any name to bring on its options for you to select and click on its left box to toggle off and on the effects. Go ahead and play around with the various styling effects to learn and test to see what each does and what combinations work best for your photo. Really fascinating! (a) Stroke – selections made were: Stroke size – 30px, Position – Inside, Blend mode – Normal, Opacity to 100%, Color – green #4ba41c. Do not close the Layer Style window as yet since there are 3 more layer style effects to be applied. (b) Inner Glow – set: Blend Mode – Normal, Opacity – 100º, Color – #fbfbdb, Technique – Softer, Source – Edge, Choke – 0%, Size – 250px, Contour – Linear, deselect Anti-aliased, Range – 12%. (c) Inner Shadow – select: Blend Mode – Multiply, Color – black #000000, Opacity – 100%, Angle – 30º, select Global Light, Distance – 7px, Choke – 0%, Size – 70px, Contour – Linear, deselect Anti-aliased. (Tip – There’s an easier way to set the Angle and Distance options. With the Layer Style window open and set to Inner Shadow, simply click anywhere inside your image and drag your mouse around. As you drag the mouse, you’ll see the inner shadow being created and the values for Angle and Distance changing dynamically. Stop dragging when you’re pleased with the results). (d) Bevel and Emboss – choose: Style – Pillow Emboss, Technique – Smooth, Depth – 100%, Direction – Up, Size – 140px, Soften – 0px, Angle – 30º, select Global Light, Altitude – 30º, Gloss Contour – Linear, deselect Anti-aliased, Highlight Mode – Screen, Color – #6ffc3f, Opacity – 100%, Shadow Mode – Multiply, Color – Black #3d7c10, Opacity – 78%. Also, click on the word Contour on the left side of window, and for Contour – pick Linear, deselect Anti-aliased, Range – 50º. (e) Acceptance – View Collage Background image to see the overall effects of the Layer Styles applied. If you’re satisfied with all the styling effects made on your photo, you can first (this is optional but advisable) save your current styling settings as a New Style for future use by clicking the button displayed on the right side. When its small window pops up, name your new style, select Include Layer Effects and Include Layer Blending Options, then click OK to save and close. Finally, to accept all the styling effects applied and exit the main Layer Style window, click OK. Should you change your mind again after exiting, just return to it by double-clicking on the Layer Style button (letter f with a circle) to the right of Collage layer in the Layers Palette and make the desired changes. That’s all! Haha…almost forgot! A gentle reminder to save the completed Collage – save file as jpeg as well as psd formats, making sure that the photoshop (psd) format is saved as layers, just in case you’d want to make some changes later on! FINISHED! HERE’S THE FINAL PHOTO COLLAGE (PHOTOMONTAGE) AGAIN! GO, HAVE FUN AND BE CREATIVE! If you’re interested, here is another fun tutorial, a photo collage of doggies! You created a very good tutorial sessions, i would definitely love to do it but i am so slow in learning things like this. I hope i can still learn it in this lifetime. I am sure many people will benefit from here which you painstakingly put together. Don’t give up on learning new things. Learning is fun and easy if you set your mind to acquire it. Did you try to create photo collages, using this Mosaic Maker link that I gave earlier, in my response to your enquiry? It’s the easier alternative to doing it on your own.